Triceratops, Brontosaurus and the ever popular T-Rex! 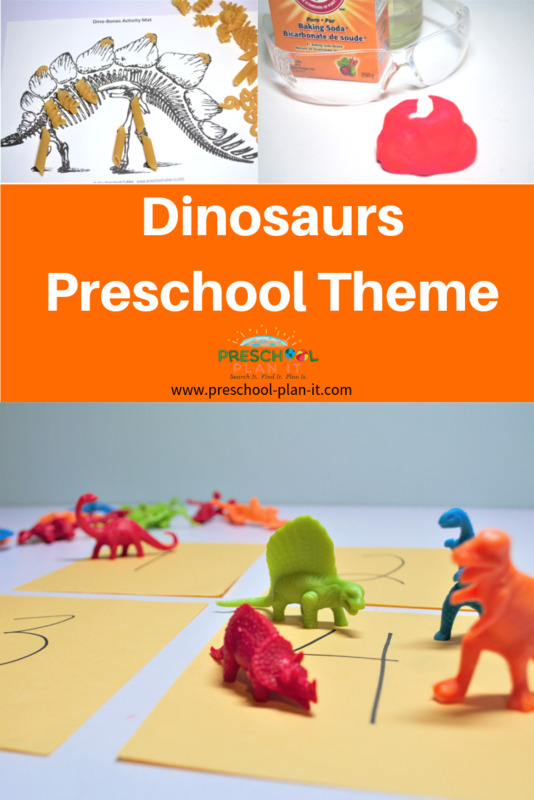 This dinosaurs theme is endless in the possible activities and adventures your preschoolers can participate in! This themed page is filled with preschool activities and ideas for all areas of your classroom. 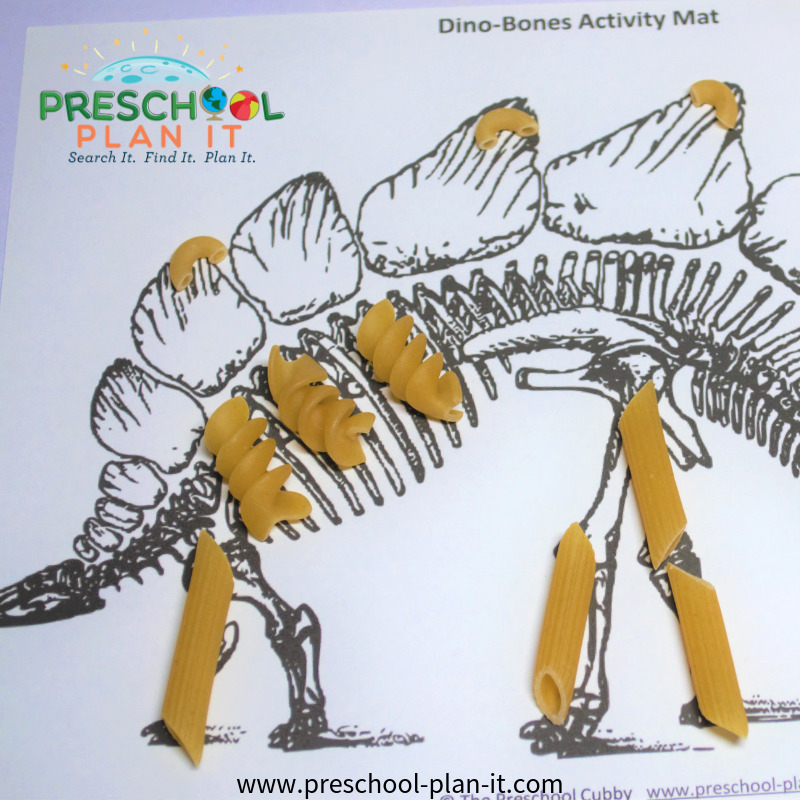 The children use the dino pasta to make a prehistoric collage. The colored scraps of paper can be used for them to make volcanoes, trees, etc. Materials Needed: (uncooked) pasta- thin spaghetti, elbow macaroni, rigatoni, etc. After reading about your favorite prehistoric dino, provide papers with dinos drawn on them. The children can create the skeleton bones from the pasta. In advance, create paper crowns and let them stamp away! Provide different colors of stamp pads for them! Materials needed: shoe boxes, yogurt container covers (4 for each box) and brad fasteners (for each yogurt cover). With box opening facing up, make 4 holes on the sides (near the bottom) to attach the "wheels" to. Hole punch one hole in the middle of each yogurt container cover. Place the cover over the hole in the box and attach using a brad fastener. Repeat for the other three "wheels". Make and place as many of these as you wish to the block area. Also provide small dinos (sorters or mini stuffed animals) for them to take on rides. Circle Time is such a great time for children to learn the social skills of being together as a large group AND to learn more about theme! Start your theme by hanging a large piece of paper on the wall at circle time. Ask the children what they know about these prehistoric reptiles! Write their responses on the chart. The word DINOSAUR means terrible lizard. People never saw a real one--people were not alive when the dinosaurs were. Some were HERBEVOIRS--they ate only plants, they were vegetarians. Some were CARNIVOIRS--they ate meat. Some were large and some were small. They were hatched from eggs. There are real fossils in the world (see if you can find some online to print and show them). They are EXTINCT, nobody knows for sure why the all died. Ask the children, one at a time, what their favorite prehistoric dino is and one fact about it. Write what they say on the paper. "I like longnecks. They have long necks and long tails"
Provide the papers to the children at the art or writing table and let them draw their dino and decorate their page. EXTENSION: When complete, staple together as a class book and read at the next circle time and then place it in the library! 5 ferocious herbivores playing in the swamp. Eating yummy plants, chomp, chomp, chomp. Place in your library area for the children to use during the day. Snack Recipe Ideas to Cook Up for Theme! Give each child a slice of the toasted bread. They spread their bread (toes!) with butter and then stick on the triangles you previously cut for nails! Unroll the tube of dough and separate the rectangular pieces. Stretch each piece with the children to make it a bit longer. Use the knife to help the children cut a 1 1/2 inch slit in the middle of each one. Roll or shape the 4 corners into knobs that look like the ends of a bone. Place bones on an ungreased baking sheet...a few inches apart. Sprinkle some salt on them. Bake until they are light golden brown (about 9-12 minutes). Ingredients needed: 1 cup plain yogurt, 1 cup sour cream, 1/2 cup mayonnaise, 2 TBSP chopped onion, 2 TBSP parsley, 1 TSP dill weed. Children help to put all the ingredients into a bowl. children help to cut up some fresh vegetables (tomatoes, carrots, broccoli, celery, etc.). Mix a drop of green food coloring into the ranch dressing and let the children take turns mixing. Make a cave by hanging a sheet over the dramatic play area or by adding a tent. Provide stuffed dinos, blankets, artificial flowers and bushes. Hang crepe paper from the ceiling. Place a blue sheet on the floor for the water they would drink or bathe in. Provide plastic eggs with baby dinos in them. Materials Needed: Different prehistoric reptile shapes and water colors. Are you brave enough to do this one?!! Materials needed: Wading pool, dirt and water! In advance, ask parents to send their children in with their bathing suits! Make mud in the wading pool and STOMP! Materials: Pictures of different dinos. Talk about how they moved (fly, walk on 2 legs, on 4 legs, little steps, big steps? As you discuss each one, have the children move to the other side of the room like that dino! The pteranodon's wings went flap, flap, flap around the prehistoric swamp! Which dinosaur had a tooth like a banana, tooth like a banana, tooth like a banana? Dinosaurs, dinosaurs, gave some fear. Dinosaurs, dinosaurs, are no longer here! Dinosaurs walked on this earth, on this earth, on this earth. Dinosaurs walked on this earth...a very long time ago. Tyrannosaurus Rex was the king, was the kink....a very long time ago. Add facts about other prehistoric reptiles you've learned about! Themed activities to help your Preschoolers develop those small muscles in their hands! Materials: LARGE prehistoric footprints made from construction paper. In small groups, encourage children to guess how many of them will "fit" into the foot prints. Write down their estimates. The children then all try to stand in the footprint, count how many friends fit and then compare it to the number they estimated. Materials Needed: Prehistoric sets of stickers and juice lids. Make pairs of matching lids. The children then use them as a traditional memory game by placing them face down and turning over 2 to see if they match. If they do, they put them aside. If they don't match, they flip them back over and try again. I recommend starting with only a few pairs first and then add more pairs as they become more comfortable with the game. For children who do not have experience with this game yet, place the lids face up for them to visually find the matches. Materials needed: copies of your favorite dinos or lots and lots of small dino sorters; 8X10 paper with numerals on them. Base the numbers you print on the number recognition AND the one-to-one correspondence you are working on. If your children are all able to count out 5 items, then make the papers 6-10 or higher. Place the number papers out and a bowl of sorters or pictures. The children should count out the number of dinos to match the number that is on the paper. EXTENSION: It may help to have the equivalent number of dots on each paper. 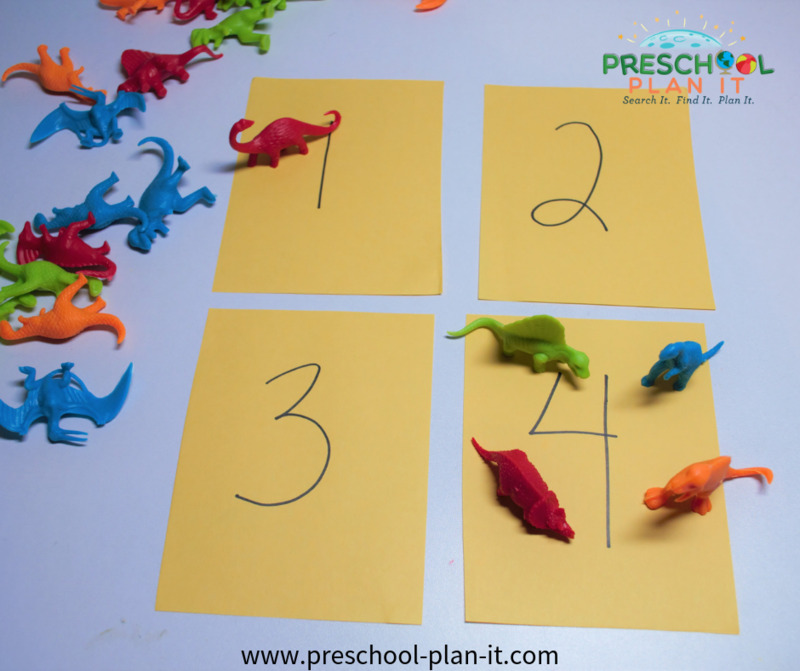 This allows your preschoolers to place one dino per dot and therefore improve their one-to-one correspondence as well as their eye-hand coordination. Materials Needed: large paper bags (grocery bags) and music. Place the bags on the children's feet for dino feet. In advance, cut out dino toes (claws). Tape them onto the bags once the children "put on their feet". Look, there's a tall mountain (hand over eyes). Can't go under it, can't go over it, I'll have to go around it! Look, there's a river! .....Guess I'll swim across it! There's some tall grass...... guess I'll go through it. Look, there's a cave!......Guess I'll go IN it! I feel some teeth...what is it? Phew...We went on a dino hunt, and I wasn't afraid! Sing and do the movements to this traditional dance but insert dino items instead! You put your front paws in, you put your front paws out, you put your front paws in and you shake them all about! You do the dino hokey and you turn yourself around, that's what it's all about! In advance make sets of different prehistoric footprints. You can make them from paper or felt, though felt could be saved and used year after year. Tape the foot prints in pairs around your dancing area. Play some dino themed music or just fun music! Tell the children that when the music plays, they should come OFF the footprints and dance and move like dinos! When the music stops, they should go to the nearest set of footprints. SUGGESTION: Your preschoolers may not used to this type of "pick any one" type of instruction. At first, if a child starts on a blue set of prints, they think of those prints as "theirs" and if someone else goes on them, you may have a meltdown on your hands! There are several ways to start out with this! 1. As they are dancing, place their nametags near a set of prints and have them freeze when the music stops. Then instruct them to find their names. 2. As they are dancing, hand them a piece of paper or felt the same color as one of the sets of footprints. When the music stops, instruct them to freeze! And then find some footprints that are the color they are holding. Materials needed: shaving cream, dino sorters and paint brushes. Cover dino sorters with shaving cream. Provide spoons and paint brushes for the children to "discover" the dinos! VARIATION: Do this same activity at the art table! Cover a dino sorter with shaving cream. Provide each child with a paint brush to find the dino! You can add paint to the shaving cream and also encourage the children to write in the shaving cream. Materials needed: sand, rocks, plastic plants, toy dinos, dirt/soil. The children use the materials to create a prehistoric habitat! Materials needed: Ivory soap flakes, water, small dino counters/sorters. Have children mix the soap flakes with water until it makes a thick paste. They take a handful and cover a small dino with it. They should make it into the shape of an egg and be sure the dino doesn't show! Let sit to dry. Take home and use in the bathtub! Let the children check these out with magnifying glasses! EXTENSION: Provide chalk and black paper for them to make their own x-ray-type skeletons. Provide playdough for the children to make their own volcanoes. 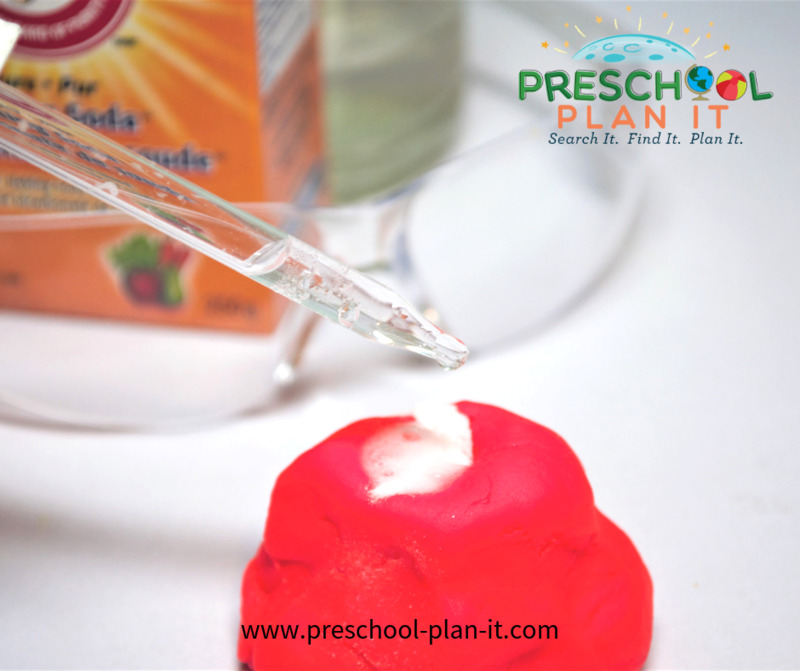 Wearing their goggles (to avoid them from touching their eyes after touching the vinegar), the children use small spoons to put baking soda in their volcano and then use the pipettes to drop vinegar on the baking soda. The Apatosaurus' footprint was known to be approximately 24 inches wide by 48 inches tall! Make one on paper and have the children guess how many children will fit! Then have them all fit in! EXTENSION: Ask children how big they thought an Apatosaurus was. Provide a 70 foot piece of yarn rolled in a ball. Take it outside and unroll it with the children. THAT is how long they were! Tape cut-outs to the table and place paper over the rubbings. Children rub the sides of crayons over the entire paper (or they can use markers) to uncover the rubbings. When done, encourage the children to use markers to trace the outline of the dinosaurs. This is a great activity to help your children develop the muscles in their hands and manipulate markers or crayons.